Greencastle, IN – The highly anticipated Greencastle Music Fest, hosted by Almost Home Restaurant, will take place in the streets of downtown Greencastle on August 25, 2018. The annual event brings the community together to enjoy a night of music. This year the event will feature local band Ellusion. The band’s special guest, LD Miller, picked up the harmonica at six years old and hasn’t put it down since. He was said to be the “world’s greatest living harmonica player” at only 14 years old. Miller, who has made national headlines across the country has opened for or shared the stage with Stevie Wonder, Buddy Guy, Blues Traveler, B.B King, Ricky Scaggs, Joe Bonamassa, Alicia Keys, India Arie, Kanye West, Jamie Foxx, Ziggy Marley, Joss Stone, James Cotton, Ricky Minor band and more. 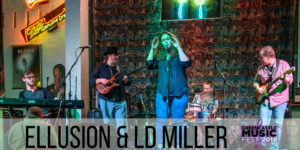 Ellusion is comprised of Sara Phoebe, vocals; Jeremy Bates, guitars; Tommy Whiteman, drums; Tim Weer, bass; Matt Bloucher, keyboards; and a special appearance by LD Miller, of the Miller Band, on harmonica. The high energy band has been playing in the Midwest for 14 years, headlining at music festivals, such as the Bean Blossom Bluesfest and Terre Haute Blues at the Crossroads. Ellusion currently plays regular shows at the historic Slippery Noodle in Indianapolis. Previously, Ellusion was the house band at the Horseshoe Casino in Louisville and has played at the Ameristar in St Louis, the Tropicana in Evansville, the Knucklehead Saloon in Kansas City, The Verve and The Velvet Room in Terre Haute. Ellusion recently recorded an album titled Ellusion which was produced by Wardco Studios in Greencastle. Their CD version of the album will be available for sale at the Greencastle Music Fest. The downloadable album can be purchased athttp://Ellusion.band or at Amazon. Ellusion can also be found on many popular streaming services and apps such as Spotify, Google Play, Amazon Music and more.